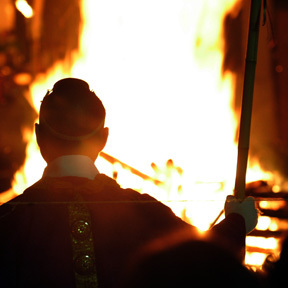 Weekend Scene » Shingon Buddhist monks from Japan performed a fire ritual yesterday at the Shingon Shu Temple on Sheridan Street, celebrating the temple's 90th anniversary. To open the ceremony, monks entered the temple and blew conch shells in front of the altar. A New Year's Eve party will be the last chance to enjoy the unique waterfront nightclub. R. Kikuo Johnson is fast making a name for himself in the alternative-comic field, and will be in Hawaii this week for three book-signing appearances. SPORTS » Who will point the way? Senior Deonte Tatum appears ready to take the reins at point guard for the Rainbow Warriors. The worse off your computer is, the better Debi Ross likes it.